Which Microcontroller Was Named After A King? Albumen Is A Frequently Used Culinary Component More Commonly Known As? 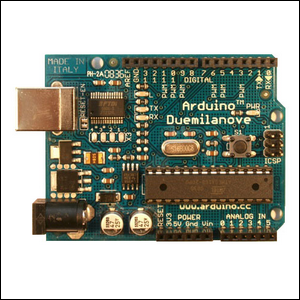 The Arduino board, for the unfamiliar, is a wildly popular open-source hardware microcontroller board that is highly extensible via plug-on and solder-on Breadboards (shields) and other circuits. Started in 2003, the project was originally intended to create an inexpensive and open-source microcontroller platform for students (as the current offerings were prohibitively expensive for students on a tight budget). Not only did it prove popular with students, but it has been a runaway success outside of college campuses where hobbyists of all stripes have adopted the versatile platform for projects big and small. If you can think of a situation where you need a computer platform of some sort, but don’t need a full blown computer (or even a complete system-on-a-board like the Raspberry Pi), then it’s likely there’s either an existing Arduino project for it, or you can easily create your own. The project and the microcontroller, by a rather round-about way, is named after King Arduin of Italy, who ruled Italy briefly between 1002-1014 CE. How did his name become attached to a circuit board a millennium after he was deposed? The founders of the Arduino project lived in the small Italian town of Ivrea, which is where Arduin was a margrave before ascending to kingship, and the location of the Bar di Re Arduino, a bar named in his honor. Several of the project founders would meet at the bar to work on the Arduino project. By way of the drinking habits of a group of 21st century computer students, the name of an 11th century king was attached to the world’s most popular prototyping board.